The construction of the Anaklia port in Georgia will commence at the end of December 2017, informs Georgia’s Commersant quoting Zurab Alavidze, the Minister of Regional Development and Infrastructure. “The construction of this port will enable us to use our transit potential completely. The Government is involved in the process because this is a public-private partnership. The Ministry of Regional Development and Infrastructure will monitor the construction phase,” said Zurab Alavidze. Anaklia is a new ambitious project of Georgia to build the country’s first deep sea port on the eastern coast of the Black Sea. The former small naval base in Soviet times, Anaklia was intended to become a resort with a marina and lots of hotels, but in 2013 this decision was changed for a multipurpose 100 mln tons port, which is expected to be part of the Chinese new Silk Road connecting China to Europe. In October 2016, the Government of Georgia signed an investment agreement with the Anaklia Development Consortium (ADC), a joint venture of TBC Holding from Georgia & Conti International from the USA, whereby ADC would develop, build, operate and maintain the Anaklia port. In March 2017 ADC presented a 50-year development plan for the port, which is designed as a gateway to the landlocked Caucasus region and Central Asia with total population of about 100 mln people. The port will be developed on an area of 400 hectares, secured by ADC on a 49-year lease concession. Additional 600 ha will be dedicated to the Free Industrial Zone. The construction of the port includes dredging works to deepen the basin to handle vessels of up to 10,000 TEU. The USD 2.5 bln port project is to be developed in 9 phases, with USD 586 mln already allocated by ADC for Phase I, when a container terminal and a rail yard will be constructed. The Anaklia container terminal will be the third in the country, in addition to APM Terminals Poti and ICTSI’s Batumi. 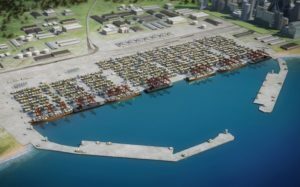 The Georgian government has committed USD 100 mln to develop the road and rail infrastructure for the new port. According to ADC, the operational launch of Phase I with the capacity of 7 mln tons is scheduled for 2020. ADC has already completed the feasibility study and in June 2017 announced the appointment of SSA Marine, the US port operating company, as the terminal operator for the Anaklia port. Another partner of ADC on this project is the maritime engineering company Van Oord, which will conduct pre-construction works on the project. Time will show how this project will materialize, but the current market looks doubtful bearing in mind the country’s economic weakness and growing competition from the ports of Iran. Georgian ports have been suffering a decline in container throughput since 2014. Last year, the country’s exports dropped by 14.93% and imports fell by 11.56%. The throughput of APM Terminals Poti drop by 15.82%.